After visiting the Wolf and Wildlife Rescue Center, the four of us, Cathy, Joe R., Joe A. and Jesse traveled to Cripple Creek, Colorado which is at an elevation of 9,494 feet and just below timberline. 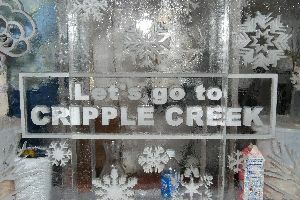 This quaint former mining town, and now a small stakes gambling town, was holding its 2nd Annual Cripple Creek Ice Festival. The centerpiece of this year's theme was an Ice Castle, created from 150 blocks of ice and weighing a total of 45,000 lbs. Unlike the Snow Sculptures in Breckenridge, power tools were used and there was no judging. Through the photos taken by both Joe R. and Joe A., you can join us as we walk down Main Street amid these beautiful works of art.